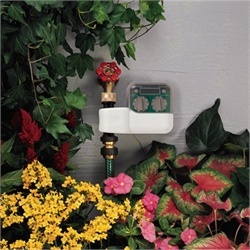 If you have installed a hose faucet connected water sprinkler system, you know how well it works and what it can do for your yard. Just like traditional in-ground lawn sprinkler systems, you need to winterize your hose faucet watering system. Since a yard sprinkling system that is connected to a garden hose spigot is different from underground irrigation pipes and other Orbit sprinkler parts, it is important you take the proper steps to prepare your hose faucet connected products for the winter time or off-season. This is relatively simple and takes very little time to do. First, you will want to drain out all your garden hoses and any valves or hose faucet connectors you have used for your garden watering system. Make sure all water has been drained from watering hoses and lawn sprinklers. Next, remove all your yard sprinklers from the water hoses. There may be excess water that can only be released by removing the sprinklers from the hoses. After detaching all water sprinklers from their garden hoses, remove the actual garden water hoses from the hose faucet manifold if you use one. If you do not use a manifold, remove the hoses from the hose spigots. If you use a faucet manifold, be sure to let any water drain out. Additionally, if you have additional valves connected to your hose faucet manifold, be sure they are drained as well. From this point, you can remove your hose faucet timer for the garden hose spigot and remove the batteries. This is an important step. If you do not retrieve the batteries from the automatic water timer, they could corrode over the winter time and ruin the timing device. Not removing the batteries will most likely result in having to purchase a new water timer at the beginning of the next sprinkler season. Find a safe and protected place to store your hose faucet watering products. This may be a shed, garage or even in the house. To protect your water garden hoses from kinking during the winter season, use a hose reel or water hose hanger to keep your water hoses compactly and neatly stored. For your garden sprinklers, use an organizer that has designated areas for each type of sprinkler. Be sure all of those organized areas are labeled: large area, medium area, small area, or by style of spray: oscillating, gear drive, impact, etc. This will help you remember how your above-ground sprinkler system was laid out. Also be sure to have your graph of how the lawn watering system was laid out so you can reference it in the coming sprinkler season. For other Orbit sprinkler parts like your sprinkler controller, manifolds and valves, have a designated area for them as well. Keep all of your sprinkler parts together in the same general area. This will save you time when setting up your yard sprinklers when the time comes. It is easy to disassemble your hose faucet watering system for the winter time by following the simple steps above. If you take the proper steps to maintain and protect your garden sprinklers and Orbit sprinkler parts, your above-ground watering system will last for many years and provide excellent lawn watering performance.